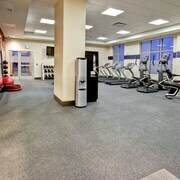 In addition to an indoor pool, Hampton Inn & Suites - Medicine Hat, Alberta, Canada provides a waterslide and a fitness center. Public areas are equipped with complimentary wireless Internet access. Business-related amenities consist of a business center and meeting rooms. A complimentary breakfast is offered each morning. This business-friendly hotel also offers barbecue grills, a picnic area, and coffee/tea in a common area. Onsite self parking is complimentary. A total renovation of this property was completed in 2016. 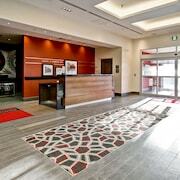 Hampton Inn & Suites - Medicine Hat, Alberta, Canada is a smoke-free property. 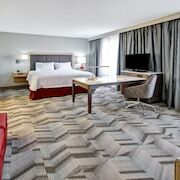 Situated in Medicine Hat, this hotel is 0.3 mi (0.4 km) from Canalta Centre and within 3 mi (5 km) of Medicine Hat Speedway and Family Leisure Centre. Esplanade Arts and Heritage Centre and Strathcona Island Park are also within 6 mi (10 km). An indoor pool, a fitness center, and coffee/tea in a common area are available at this smoke-free hotel. Free buffet breakfast, free WiFi in public areas, and free self parking are also provided. Additionally, a business center, meeting rooms, and dry cleaning are onsite. All 125 rooms offer free WiFi and free wired Internet, plus refrigerators and LCD TVs. Other amenities available to guests include free weekday newspapers, free local calls, and laptop-compatible safes. 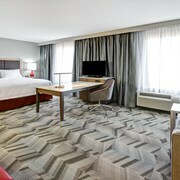 Hampton Inn & Suites - Medicine Hat, Alberta, Canada offers 125 accommodations with laptop-compatible safes and complimentary weekday newspapers. 40-inch LCD televisions come with pay movies. Bathrooms include shower/tub combinations and complimentary toiletries. Guests can surf the web using the complimentary wired and wireless Internet access. Business-friendly amenities include phones along with free local calls (restrictions may apply). Housekeeping is provided daily.